Recently I had a client who needed to migrate his blog from WordPress.com to a self-hosted install. This was a first for me, so I made a few notes to help me in the future and hopefully for anyone else doing the same thing. This isn’t intended to be step-by-step migration guide, instead think of it as a series of signposts warning you of potential hazards along the path from WordPress.com to the world of self-hosting. To start, just so we’re clear, the aim was to re-create a site that was hosted on WordPress.com on a standard shared hosting package. The client wanted to keep everything as close as possible to how it was on the original site including the various plugins, widgets and the theme. The hosted version of WordPress run by Automattic. AKA ‘self hosted’. A standard install of the open source WordPress project on a third-party hosting platform. The first thing to look at was the theme (in this case Notepad). In this case the theme is quite old and no longer supported on wp.com, but as it is open source and free it was still possible to download it and activate it on the new site. However there were some differences between the version on wp.com and the open source version. I assume that theme has been changed for a more consistent experience on the hosted platform, but these alterations haven’t been back-ported to the theme. Adding support for the navigation menus was fairly easy – just a bit of code and some tweaking of the CSS to fit the new selectors. As the client wasn’t intending to change them in the near future, I simply hard-coded the custom header and background images into a new child theme. Whilst it would have been possible to add the infinite scroll to the theme we decided that the infinite scroll element wasn’t really essential to the functioning of the site so I left it as it was. Summary: if you are planning to use the same theme as on WP.com, make sure any essential features are available in the open source version. Ideally, if the theme is outdated, then find a new theme to work with instead. Having set up the theme on the new install, I needed to get the content out of the old site and into the new one. 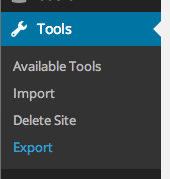 WordPress has a built-in export function which should do the job (located under ‘Tools’ in the admin area), but it has some limitations. Personally, I think this is a pretty big failing of the exporter. These settings constitute a large part of what makes a site unique and having to manually copy and input all the settings is quite tedious. Most of these things can be moved across to the new site, but as they have a few pitfalls of their own, I will look at them individually. Summary: double check what settings you want to keep when you migrate. It’s probably useful to do a side-by-side comparison in two browser tabs to check what has changed. First of all, install the Jetpack plugin. If you haven’t used it before, Jetpack was created by Automattic to take some of the services that WP.com users get out-of-the-box and allow a standard WordPress install to use them. Once it’s activated, you will need to connect it to your wordpress.com account. You should see your new install listed with your old site at https://wordpress.com/sites and in your new install there will be a new menu item in the admin called ‘Jetpack’. Jetpack is made up of a number of modules which need to be activated individually once the main plugin is set up. These include some of the widgets and sharing options that are found on WP.com along with the stats module. The first thing to understand is that not all widgets on WP.com have an equivalent available for wordpress.org installs (even with Jetpack activated) so you may have to search the plugins directory for a replacement or simply live without the widget. Also, even where there is an equivalent widget available, the configuration and output are not always the same so you may find things looks a bit different. 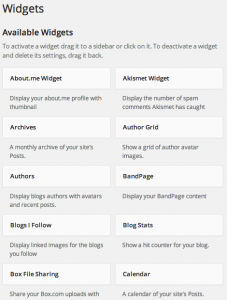 As an example, the Jetpack Twitter feed widget requires you to create a custom widget on Twitter and insert that into the WordPress widget rather than just setting your user name. Also, the output uses the standard Twitter styling rather than custom markup so you may have to adjust some CSS to make sure it fits with your theme. In my case there was only one widget that the client wanted which didn’t have a direct equivalent (the blog stats widget). As it was a simple one, I simply coded up a replacement using the stats API which did the job. Reminder: your widgets, widget settings and sidebars will not be imported with the content so you will need to do some configuration to get things set up. Now for some bad news. If you have been using the WordPress.com like button on your site, those ‘likes’ will not be migrated. They seem to be deeply embedded with the WP.com infrastructure and there is no automatic or manual migration option. See this support thread for more details. Note that this does not apply to Facebook likes or shares or Twitter tweets counts. These are based on the URLs of each post so as long as that has stayed the same (ie. your permalink structure hasn’t changed) then any FB like / share or tweet counts should also stay the same. If your site is under a wordpress.com subdomain (eg. http://mycoolblog.wordpress.com) then you will need to buy the domain forwarding add-on to make sure that any URLs are redirected to you new site (http://mycoolblog.example). Summary: WP.com likes cannot be migrated, but Facebook likes and tweet counts will come across automatically as long as the URLs for your site remain the same. As WordPress.com is a network of sites, it provides a ‘follow’ button to allow users to subscribe to their favourite sites and get updates in the wp.com reader. You can migrate these followers to your new site so that they continue to receive updates from your new install. To do so, simply visit your list of site at https://wordpress.com/sites and find your new Jetpack connected site. There should be a link called ‘Manage’ which will take you to a page where you can choose which WP.com site you want to migrate the followers from. It can take a day or two for everything to come over, but you should get an email from the support team when it’s done. In my case it was a bit more complicated as some of the followers had already been migrated in error to another Jetpack-enabled wordpress.org site, but a quick email to the WordPress.com support team got both followers merged and moved over to the new site. One of the nicest features of WP.com and Jetpack is the simple stats plugin that keeps track of visitors to your site. Naturally, my client wanted to keep all that useful information and, importantly, access it in one place. There is no migration tool for stats, but an email to Jetpack support got the data moved over in a day or so and merged it with the stats for the new install. WordPress.com allows visitors to rate posts using a simple 5 star widget. This is backed by PollDaddy which is a service run by Automattic which, as the name suggests, is mainly used for adding polls and surveys to sites. Create a new PollDaddy account. You can use your WP.com user details to log in and then connect to new account. Set up ratings settings on the new site using the details of the new account. Now, according to this support thread should be able to sync the existing ratings from your old site over to the new site by ticking a box in the settings page. In my case though, that didn’t seem to work so one final email to WordPress support was required. I did need to update one or two values in the wp_options table to make sure I was pulling the correct data for the new site, but once that was done it all seemed to work fine and the existing ratings all synced up with the posts on the new site. Summary: Followers, stats and ratings can all be migrated, but you will need to contact wordpress.com support to complete the process. As you can see there are quite a few things that can trip you up on the path to migration. Ideally there would be one comprehensive process that would pull all the essential data across to the new site without the hassle of fiddling with settings and sending support requests. Nonetheless, it is possible to get almost everything migrated with a bit of work and patience. Posted in WordPress and tagged followers, jetpack, migration, ratings, stats, wordpress.com, wordpress.org.